DAVID GREGORY, anchor (Washington, DC): Now to the Mississippi River flood. The slow-moving disaster is set to hit areas in the path of the spillway that was opened last week. But there is some good news. The National Weather Service today lowered its flood crest forecast for Butte LaRose , Louisiana , by two and a half feet. Here's NBC's Anne Thompson . ANNE THOMPSON reporting: The floodwater from the Mississippi is a silent menacing stalker here in Louisiana , today blocking this road to the Sherburne Wildlife Management area in the Morganza Spillway . Unidentified Man: It should have been drowning. THOMPSON: The water's already claiming deer and creating new places for alligators to swim. On the other side of the Atchafalaya , some homes closest to the river are in it, while those on the other side of the levee in Krotz Springs are dry. With almost everyone evacuated, the Louisiana National Guard is ready for what comes next. Mr. KENNETH BAILLIE (Louisiana Army National Guard): Our hope is that this is an exercise in preparedness and an exercise in coming to the aid of a community that, frankly, our hope is that we never have to execute. THOMPSON: Vicksburg, Mississippi , still needs help. This week the river set a new record, reaching 57.1 feet, some 14 feet above flood stage . Here Martha Haggard can barely see the home she bought in 2004 , now submerged in fetid water. Ms. MARTHA HAGGARD: I don't think I'm going to go back. To tell you the truth, I don't really think I'm going back. THOMPSON: The flood's been a boon to Ronny Tyler 's T-shirt business. Mr. RONNY TYLER: This is where my daughter sleeps. THOMPSON: But he can't get to his home. Mr. TYLER: Excuse the mess, but can kind of get kind of hectic. It was mandatory evacuation. It was just hard to do it. I'm sorry. THOMPSON: The flooded Mississippi now rolls south at 13 miles an hour, more than double its normal speed. This historic amount of freshwater is beginning to impact some of Louisiana 's delicate oyster beds still trying to recover from four hurricanes in five years and last year's BP oil spill. Mr. RANDY PAUSINN (Louisiana Department of Wildlife and Fisheries): If the oysters die, well, we lose that from market this year. However, that's reef material for new oysters to grow on for next year. GREGORY: Anne Thompson , thanks very much. Part of the Morganza Spillway, seen at top center in this satellite image, has been opened to take pressure off the Mississippi River, seen winding at center right. 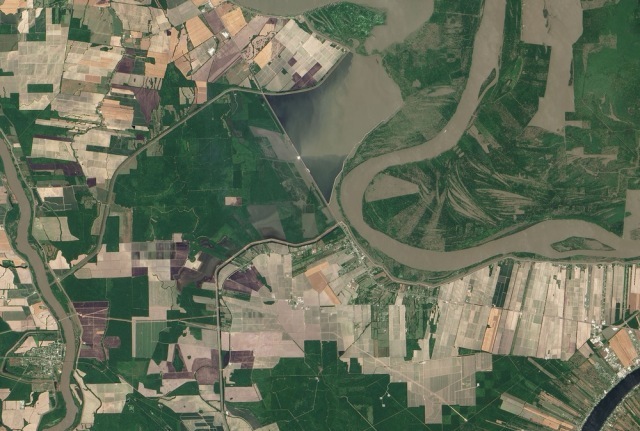 Homes and farms southwest of the Morganza are being flooded as water makes its way into the Atchafalaya River, at far left, and the river's fertile basin. Levees are seen lining the basin, starting from each side of the spillway's edges. The basin continues south, through towns like Morgan City, before emptying into the Gulf of Mexico.